When did New Yorker Bagels (Fresh from the Oven to You) become plain old LIC Bagel? I'm not around here too often, so this could have taken place a while back. You only have to wave a camera in their direction. Whether it's Roosevelt beneath the 7, or the nether worlds of sub-expressway Third, the buildings and the empty lots frame themselves with ironwork and fractured light. Even the most ordinary resonate. These are on 31st Street, Queens. On the Bay Ridge/Sunset Park border three venerable Scandinavian sports clubs are hanging on. On 65th Street the Danish Athletic Club and the Swedish Football Club are close neighbors. On 62nd Street there's the Norwegian Sporting Club Gjoa. The Danish club was founded in 1892, in Red Hook, and moved to its current location in the 1940s. You can dine here as a non-member, though on Saturdays the club is closed for party rentals. I recently made the novice's mistake of turning up on the wrong night, but plan to return soon for a meal. Lost City blogger Brooks of Sheffield paid a visit there a year or so back for his Eater Who Goes There? series. It's a great post, well worth checking out. Earlier this year the Times ran a piece about the place too, focusing on the club's relationship with the local Mexican community. I don't know much about the Swedish club, but it seems to be still active. I think it's been around since the 30s. I did find a Swedish film clip of a visit to the club several decades ago. Appreciating it fully without a knowledge of Swedish is a bit tricky, but you can still enjoy the streetscape, the inside shots of the club, and the lively summer festivities out back. And you can at least try to imagine what's being said. The boisterous lady at the end of the film is very expressive. The Sporting Club Gjoa was founded in 1911, and still has a successful youth soccer program. Regular membership numbers are scant though, as they are at the other two clubs. I hope all three associations can gather enough support and community investment to remain in their old sporting grounds for years to come, and keep some of the old cultural traditions alive, even as the area's demographics continue to shift. These places are a proud & important piece of city history. Great detail on this Sevor-ized truck. Off Eighth Avenue, Sunset Park. A recent analysis by the Wall Street Journal showed that more than 20 Manhattan gas stations have closed since 2003, almost all of them on the West Side. Of the 12 remaining stations below 96th Street, seven of them are in Midtown West, Chelsea and the Meatpacking District. That puts them into the orbit of the High Line and Hudson Yards, two projects that are radically reshaping the surrounding districts. "The West Side is going to be better than any other neighborhood," Polsinelli said. "There will be no land left unturned." Farther downtown, two other stations are already on their last legs. The BP at Houston and Lafayette is expected to close this year to make way for a seven-story retail and office complex. A Mobil Station in Alphabet City is also expected to close shop. I've been sick for a couple of days. As a result I've been housebound - sneezing and coughing, and swigging back gallons of PG Tips. A sorry sort of business. 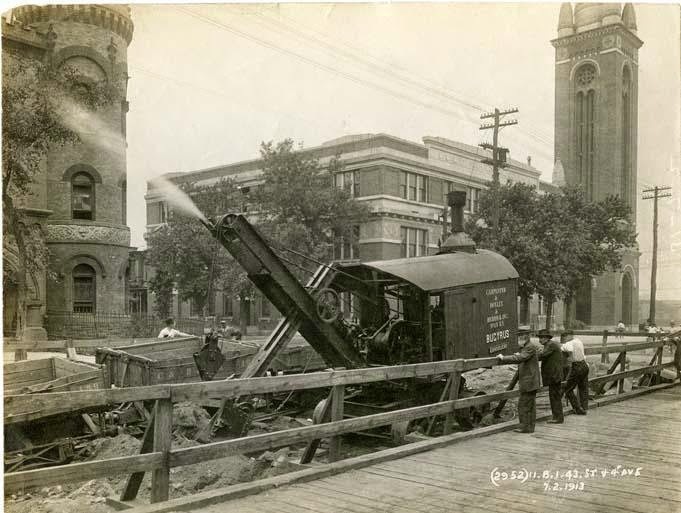 So here's a stay-at-home photograph courtesy of Brooklyn Visual Heritage showing construction work on the 4th Ave. subway line in Sunset Park. The picture, taken in 1913, shows one of the neighborhood's grandest architectural intersections, Fourth & 43rd. You can see St. Michael's church & school in the background, at right, and at left the magnificent Romanesque Revival 68th Police Precinct Station House & Stable, which was last used in 1970 and is in sorry shape today. The neo-classical Sunset Park courthouse was constructed some twenty years after this photograph was taken, and still stands at the north-east corner of the intersection. Today it is used by Community Board 7 and the NYPD. What an institutional hub. This is almost as far as I have walked on my block-by-block loops from 9th Street south. Laundromats are falling fast. Here's the latest at 471 Fifth. The building sold last month for $2,500,000, and despite a "makeover" of its store sign last year H & B Happy & Brite is no more. The store is now for rent. Meanwhile, an avenue over, the old Estevez bodega is transforming. Looks like there will be some sort of grocery store here still - rather surprising for grocery depleted Sixth. The last number 1 stop. Broadway under the Van Cortlandt station is a scrubby stretch. A little distance away, idle trains slumber, gleaming in the noon sun. We ate lunch in the Short Stop coffee shop, which was worth visiting for the name alone. A couple of ballpark posters up by the counter kept the connection. You couldn't call this place enticing: two TVs showed a crappy Adam Sandler movie, the bathrooms were worn & the vinyl upholstered booths a sickly shade of mauve. And yet. The food is cheap (and A graded, if you care about that sort of thing). The service is friendly. And the company you keep is exactly what you wish for and gets harder and harder to find deeper in the heart of the city. Behind you, a couple of white parents and their leggy pre-teens, quietly gossiping about the social niceties of middle school. Ahead, a crowd of giddy post-church mothers and children, laughing and joking in a mixture of Spanish & English. The smallest girls wore frothy, tiered dresses and party shoes. And scattered about the room several men dining alone. Regulars, who knew the wait staff well. Men who could have walked right out of Rogosin's Bowery, in clothing that had worn itself down into unknown shades of gray, and with faces wild and weathered. And a kind of decorum reigned. All in our own worlds, yet all together, and the waiter attentive to each customer. Without the mix, the tolerance, the mutual respect, the cafes, bars & public spaces where we linger together, even briefly, what's the point of being here at all? Around the corner from the 50th Precinct on 236th Street. "Police & Security Equipment Bureau is a family-owned-and-operated business with more than 50 years of experience outfitting the New York City area with the appropriate accessories and uniforms for the city's finest." On a couple of blocks, a boomtown microcosm. As of today, this stop order, relating to excavation damage, is not on record online at the DOB website. THE CONSTRUCTION FROM THE NEIGHBORING PROPERTY 294 12 STREET IS UNPINNING BY BUILDING CRACK FROM THE BASEMENT TO THE ROOF. ON BACK WALL. IT IS A "STEP CRACK". Multi-families are selling like hotcakes. Here's 310 12th Street, a twenty unit building with rent-stabilized tenants, recently sold for 6 million to the Slate Property Group. Slate has an extensive portfolio including multi-family/mixed use properties, and ground-up development & conversion projects. The latter includes the big apartment developments at 470 Fourth (Fourth & 11th), and at 275-281 Fourth (Fourth & 1st). "During the last five (5) years, the principals of Slate Property Group have purchased in excess of $1 billion in real estate assets achieving above market returns through various value-add and development strategies ... Slate Property Group has an established strategy of pursuing opportunistic real estate investments located in the New York metropolitan area. Slate leverages an entrepreneurial approach, a fully integrated platform and extensive relationships to acquire, develop, reposition and operate real estate." on Schermerhorn & Court Street. I was happy to come across this building, close to Second. 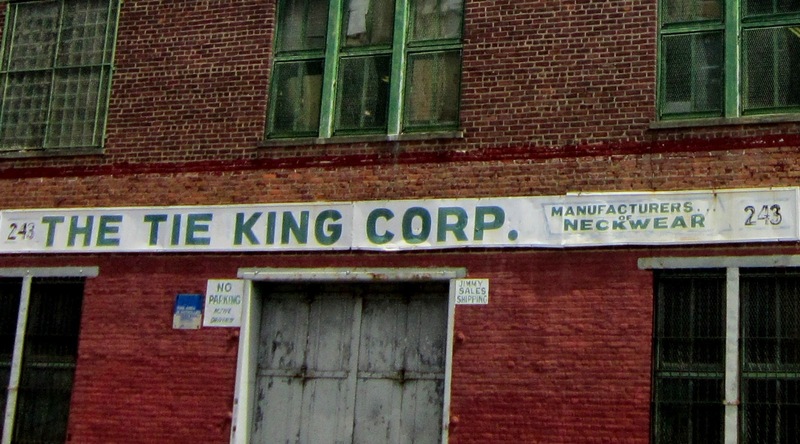 It's home to The Tie King Corp, Manufacturer ... of Neckwear. A great company name, with the ellipsis adding an unintentional layer of ambiguity. The Seaberg Elevator Company brought their business here in 1939. 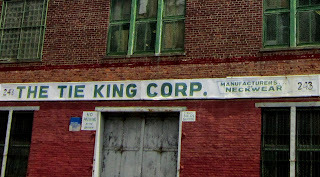 Tie King (Jimmy Sales Corp.) appears to have been in business since the 50s, making Mens' & Boys' neckties and bowties (vintage, formal, dress: white tie, silk). I'm not sure how long they've been at this particular address. I like looking down at 10th Street on the way out of the station. The old yellowed glass, and slivers of streetscape through open windows or broken glass. A wisp of a bird's nest on a windowsill, and a cool draught of late spring air. Almost home. "Located a few short steps from Prospect Park as well as the best of Brooklyn’s outstanding food scene, this houses proves that nothing goes better with having it all, than also being near it all. This 22 foot wide, five-story, historic brownstone ... seamlessly mates mansion-like dimensions, to wonderfully preserved original details, and tastefully integrated, modern amenities. It is no small feat to balance the grand, the subtle, the decorative and the functional, especially in well over 6000 square feet of living space. Here it has been executed with masterful aplomb. The abundant features such as original gas fixtures, stained glass, parquet floors, pocket doors, are infinitely more pleasurable to experience while ensconced in the comfort of central air conditioning." Is the $2,899,000 asking price for a condo in the former St. John's parochial school (21st Street ) a new high for the South Slope/Greenwood area? My sequence of walking is not broken, but the recording of same is still out of whack. We'll get this back in shape soon. In the meantime I jump over to 44th Street between Third & Fourth, a mixture of brick and wooden apartment buildings and smaller one or two family frame houses. Close to Third, the Bay Ridge Day Nursery. The Nursery, founded in 1917, is one of the oldest child care centers in the city (or country), and the third oldest in Brooklyn. 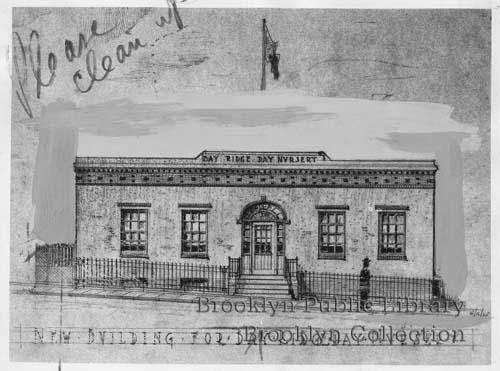 Originally located on Fourth Avenue, between 38th and 39th, ground was broken for the 44th Street building in 1935, with funds allocated by the Brooklyn Bureau of Charities. From the outside, the building has changed very little since the 30s, apart from losing its nursery inscription up top, and a few of its front steps - presumably due to the street having been built up over the years. Are the nursery rhyme tiles on front of the building original? A little further up the block, a tiny house set way back from the street, with Pop's Garage, a Harley decorated trailer and a couple of cars up front. And at Fourth, an iconic Sunset Park business: Tacos El Bronco, with a fine mural to mark the site, and the truck on the avenue, busy with lunchtime customers.